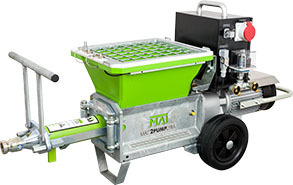 The MAI®2PUMP-LYRA is a versatile plaster pump for both standard and airless applications on the construction site. The MAI®2PUMPTAURUS is a powerful workhorse on the jobsite. 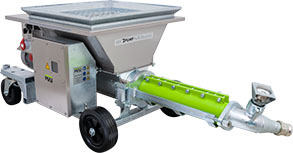 This virtually indestructible concrete pump offers high performance in the toughest conditions. The MAI®2PUMP-PICTOR is an extraordinarily useful and easy to use continuously adjustable pump. It is a powerful mortar pump, as well as being very suitable as a grout injection pump for building injection work. Innovative MAI delivery pumps are an essential part of modern plastering work on construction projects. 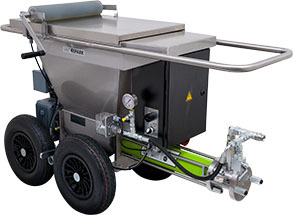 Delivery pumps that work with construction site plastering systems are machines that can process machine-compatible, premixed, paste-like compounds and liquid media such as coating materials, flooring compounds, dyes, adhesives and also ready-mixed site mortars. The materials are either injected or pumped into the desired position as needed around the jobsite. MAI International GmbH offers a range of delivery plumps for plastering work on construction sites. Let MAI delivery pumps be a valuable partner on your construction job. Talk to us about the range of versatile MAI cement pumps.